Abernethy (Scottish Gaelic: Obar Neithich) is a village in Perth and Kinross, Scotland, situated 8 mi (13 km) south-east of Perth. The village's name is Brythonic, and means "mouth (aber) of the Nethy". The earliest recorded form being Apurnethige. The Nethy Burn flows down from the Ochil Hills past the present village. The name of the Nethy is believed to be cognate with that of the River Nith and possibly Neath. The Gaelic form of the name is Obar Neithich and derives from the same roots as the English name. The village was once the "capital" (or at least a major religious and political centre) of the kingdom of the Picts. The parish church, which sits on land given by Nechtan,a king of the Picts, is dedicated to Saint Brigid of Kildare of (fl. 451-525), and the church is said to have been founded by Dairlugdach, second abbess of Kildare, one of early Christian Ireland's major monasteries. Abernethy was the site of the Treaty of Abernethy in 1072 between William the Conqueror and Malcolm III of Scotland. Abernethy is believed to have been the seat of an early Pictish bishopric, its diocese extending westward along Strathearn. In the 12th century the bishop's seat was moved to Muthill, then Dunblane, so that Abernethy, no longer being a residential bishopric is today listed by the Catholic Church as a titular see. Abernethy remained the site of a small priory of Augustinian canons, founded 1272. In the 15th century, this priory was suppressed in favour of a collegiate church under the patronage of the Douglas Earls of Angus. Remains of the collegiate church survived until 1802 within the present village graveyard, when they were replaced by the present plain red sandstone church, which is still dedicated to Saint Brigid. The village has one of Scotland's two surviving Irish-style round towers (the other is at Brechin, Angus); both are in the care of Historic Environment Scotland). The tower stands 74 ft (23 m) high, and it is possible to climb to the top, using a modern metal spiral staircase (the tower originally had several wooden floors linked by ladders). The tower was evidently built in two stages (shown by a change in the masonry), and probably dates to the 11th-early 12th centuries. Several pieces of Pictish or early medieval sculpture have been found in Abernethy, including an incomplete Pictish symbol stone attached to the base of the round tower. The location "Afarnach's Hall" referred to in the earliest mediaeval Arthurian literature is usually identified as Abernethy. The small but well stocked museum, open 2pm to 5pm from Wednesday to Sunday between May and September, has exhibits on the history of the village and also holds a key to the tower. Over the years local industry and commerce has largely declined. A general store is the only shop remaining on the Main Street (the post office having closed in early 2009). However, the village still manages to support two local pubs and a tea room (which also holds a tower key). A mobile post office also visits the village most weekdays. A Gala / Fete Day is held annually on the first or second Saturday in June, with a race to the top of nearby Castle Law taking place the following day. The village is located near the M90 motorway and has regular bus services connecting to nearby towns. Abernethy railway station served the village until 1955, when it was closed by the British Transport Commission. 1.^ The foundation of Abernethy is to be found in the Pictish Chronicle and links it to Nechtan Morbet. However, it may have been Nechtan nepos Uerb, and the later Nechtan mac Der-Ilei may have been confused with the previous two. Wikisource has the text of the 1921 Collier's Encyclopedia article Abernethy. ^ "Comparative Population Profile: Abernethy Locality". Scotland's Census Results Online. 2001-04-29. Archived from the original on 2011-05-19. Retrieved 2008-08-31. ^ "Historic Environment Scotland". www.historic-scotland.gov.uk. Retrieved 19 April 2018. ^ "index". www.museumofabernethy.co.uk. Retrieved 19 April 2018. ^ "Perth & Kinross Council - Kinross-shire and Bridge of Earn area timetables". www.pkc.gov.uk. Retrieved 19 April 2018. 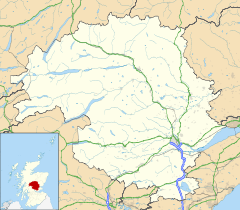 Wikimedia Commons has media related to Abernethy, Perth and Kinross.